SAN FRANCISCO at the World Agri-Tech Innovation Summit, Mar. 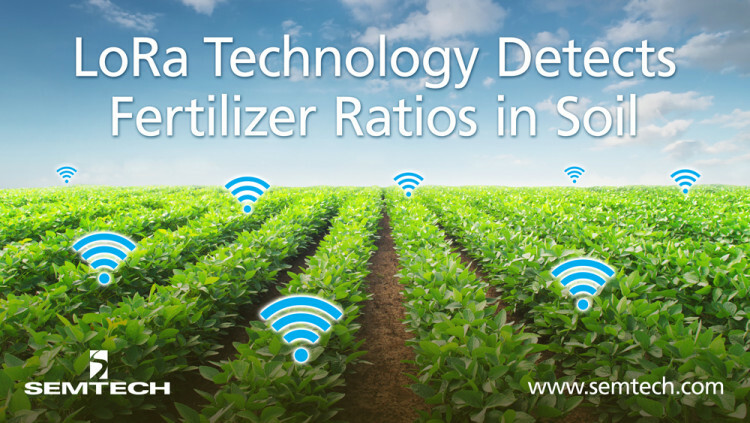 20, 2018 – Semtech Corporation (Nasdaq: SMTC), a leading supplier of high performance analog and mixed-signal semiconductors and advanced algorithms, announced that Teralytic, a manufacturer of wireless soil sensors, implemented LoRa® devices and wireless radio frequency technology (LoRa Technology) in its wireless sensor to detect nitrogen, phosphate and potassium (NPK) levels in soil to help farmers reduce waste and to improve crop yields. Teralytic provides one of the first wireless NPK (nitrogen, phosphate and potassium) soil sensors for farmers to maximize their profits. Get the most detailed soil quality data available, via a single probe with 26 sensors reporting soil moisture, salinity, aeration, respiration, NPK, air temperature, and humidity - at three different depths. For more information visit www.teralytic.com.